Did everyone have a nice Columbus Day? I work for a nonprofit native foundation and we get the day off from work, but we certainly don't call it Columbus Day. We call it "Family Wellness Day" and I think that is much more appropriate. Do you know anyone or any group that abstains from celebrating good ol' Columbus? I spent the day organizing the kitchen and guest room, and just generally toiling away at home. Well, it's that time again. Time to clean out the fridge before a vacation! Usually this means some sort of soup, but I wanted to make something different and I remembered that I had a package of phyllo dough in the fridge. Now, I'd like to be able to tell you that the dough wasn't a few months shy of it's one year birthday...but that would be a lie. Yes, in fact the last time I used the dough was for this recipe. I know, it's completely shameful, but "waste not, want not" is what my Grandma D always says. The phyllo was totally fine. It was in an unopened roll...that shiz lasts forever. Unless it's opened, then it lasts about two minutes. Phyllo can be a tricksy monster. It's now a horrible race to take my photographs without surrendering to the artificial lamp. The sun begins to wane at about 4 pm, as you can see from the photos in this post. I suspect this is the last post without the dreaded lamp. A sturdy and healthy tofu pot pie casserole made with phyllo dough and common vegetables. Quick and easy for a weekday dinner! In a large soup pot, heat the olive oil over medium-low. Add the celery and potatoes, bringing the heat to medium and sauté for about 5-8 minutes. Then add the onion and garlic. Sauté another 5 minutes. Add the peas and corn and sauté for 3 minutes. Now, add the milk stirring well to combine. Slowly add in the flour, stirring to combine and ensuring there are no lumps. Stir in the tofu.Mix in the remaining ingredients, excluding the phyllo dough and reserving 1 Tbsp. nutritional yeast. Preheat oven to 350 F and coat a large 9 x 13 casserole dish with a nonstick cooking spray. Place 4 sheets of phyllo dough down then cover with half of the pot pie mixture. Add another 4 sheets of dough, then the other half of the mixture. Finish with 4 sheets of dough, coating them with a bit of olive oil and sprinkling with 1 Tbsp. nutritional yeast. Bake at 350 F for about 30 minutes and serve hot. Do you know someone who suffers from multiple sclerosis? Invite them read this new study on the benefits of a low-fat, vegan diet on the disease here. It's worth a shot! That's actually how Todd and I became vegan. Not because of MS, but through seeking relief from rheumatoid arthritis. Hello! How have your Holidays been so far this year? Mine have been terribly busy. And also quite frankly, a smidgen frustrating...I'm looking at you, UPS, Shutterfly, and West Elm! However, there were times of relaxation that included walks in the snow and watching Dracula on Hulu. You know, the one on NBC with Jonathan Rhys Meyers? How they are allowed to show that on normal television is waaaay beyond me, but after watching The Tudors, I'm down for anything with Jonathan Rhys Meyers. Even if it is watching scary Dracula...around Christmastime. Oh well. If you haven't seen either of these shows, first, shame on you. And second, what are you waiting for?! For Christmas morning brunch at my Grandparents' house, I made this. Sooooo amazing. And for Christmas dinner I brought along my favorite drink ever and this Spanakopita! Spank-eee-o-pita. I was informed this is not the correct pronunciation of this dish. It's spa-na-ko-pi-ta, which, now that I look at it...makes a lot more sense. I have no idea where I got my pronunciation of it. My family never made this dish, growing up. Honestly, I think I've only had it a couple times. My BFF used to make it a lot and I remember liking it, though I obviously never learned how to properly pronounce it. I had some leftover phyllo dough in the fridge, which of course, I couldn't bear to waste and I thought might be a sign that it was time to take on the spank-eee-o-pita. Traditionally, I believe it involves feta. But don't freta (hah hah hah), feta doesn't make an appearance in this spanakopita! The flavor and texture of feta, however, is mimicked by a combination of chickpeas, nutritional yeast, tahini, vinegar, and lemon juice. Yes, this dish has all the wonderful flavors of the traditional, but with a little more benevolence. It's friendlier to the earth, to the cows, the chickens and to your body! I should've called it Friendly Spanakopita! In a large saute pan, heat the olive oil over medium-low. Add in the chopped onion and green onions and saute for a few minutes, until the onions have started to soften. Now, add in the garlic and continue to saute a few more minutes, until the onions have become translucent. Add the spinach to the onion mixture and turn the heat up to medium. Allow the spinach to cook until all the water has evaporated, stirring occasionally. This will take some time, about 10 minutes or so. Meanwhile, mash up the chickpeas. Once all the water is gone, add in the rest of the filling ingredients, including the remainder of the lemon juice once 1/4 cup has been set aside, but excluding the phyllo dough. Combine well and allow to cook for another 5-10 minutes, until thoroughly heated while stirring occasionally. See my reindeer dish towel?? Meanwhile, preheat the oven to 350 F and whisk together the glaze ingredients in a small bowl. Spray a 9x13 baking dish with a nonstick cooking spray and place one sheet of the phyllo dough on the bottom of the pan. Lightly brush with the glaze to coat, then place another sheet on top of that and glaze. Repeat with an additional four sheets. There should now be six sheets stacked, total. Now, spoon the filling into the dish and smooth over so it's even, ensuring to fill the corners. Place a sheet of phyllo dough on top of the filling and continue the glazing process with the other half of the phyllo dough sheets. There should now be six on the bottom of the dish, followed by the filling, followed by six more phyllo dough sheets. Be sure to brush the very top sheet and even spray it with some nonstick cooking spray. Bake for about 35 minutes at 350 F. Remove from oven and allow to rest for five minutes. Then, slice into eight rectangles and serve hot! Scrumptious! Salutations! First, I just have to tell you how much I adore BlogLovin'. If you lost a subscriber today or yesterday, it may have been me. Never fear though! I added all the blogs I follow to BlogLovin'! I'm still following, it's just that now I don't get 60 emails in my inbox everyday. It's fantastic! I am in no way affiliated with BlogLovin', I just really, really like it! If you are a follower of a few or more blogs yourself, go check it out. It's definitely made my e-mail and blog following so much simpler. You can add any blog you want! Okay, back to the recipe. 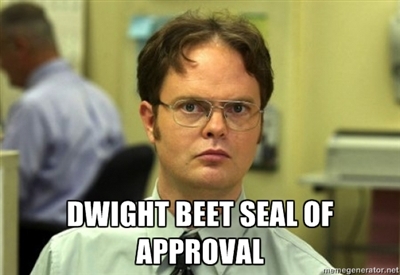 Last night, when I told Todd what I was making for dinner he told me, "I'm not much of a beet man." Not yet. That may have all changed after I made this Rosemary Balsamic Beet Layered Phyllo Tart, though! This really is a beautiful little tart. I love that it can be a fancy appetizer or a light, snazzy entree. It's easy, fairly quick and it's dressed to impress! This post is dedicated to Dwight from The Office. Crispy, light and buttery phyllo dough is topped with a creamy rosemary cashew cheese then adorned with layered tangy and sweet maple-balsamic roasted beets. Perfect for holiday company! First, if your phyllo dough is in the freezer, you'll want to thaw it out according to the package. To make the cheese, first place the cashews in a bowl and cover with an ample amount of boiling water. Allow to soak for at least 15 minutes, while preparing the rest of the tart. Then, drain and rinse well. When the cashews are done soaking, add all ingredients to a food processor and process for about 3 minutes, scraping occasionally, until it's smooth like ricotta. Preheat the oven to 350. With a mandolin, slice the beets very thinly. Or, if you have better knife skills than me, feel free to go at it with a knife. Place all the beet slices in a 9x9 or larger baking dish. Add in the balsamic vinegar, syrup, salt, and pepper. Toss to coat and roast at 350 F for 15 minutes. Stir and flip the beets halfway through. Once the beets are done, remove from the oven and set aside. Be sure to reserve the beet liquid. Leave the oven on. Coat a tart or pie dish with a nonstick cooking spray. Carefully place one sheet of phyllo dough into the dish and press in. Brush the top with vegan butter. Continue with remaining sheets, layering them, alternatively along the edge. Be sure not to let the sheets dry out excessively while assembling the tart or else they will just break when folded. You'll want to work fairly quickly. Phyllo dough is pretty persnickety. Next, spread the cashew cheese evenly along the bottom of the dish, on top of the last phyllo sheet. Then, layer on the beets to fill the bottom. Fold or tuck in the excess edges of the phyllo dough. Brush butter along the top of the dough as well as the beets. Bake at 350 F for 20 minutes. While the tart is baking, pour the beet liquid into a small saucepan and bring to a boil over high heat. Then, whisking, turn down to low and allow to simmer until it's reduced by about half. Whisk occasionally. Once the tart is done baking, remove from the oven and pour the balsamic beet liquid over the tart. Serve the tart slices warm and with love! Fancy pants and oh so beetylicious!